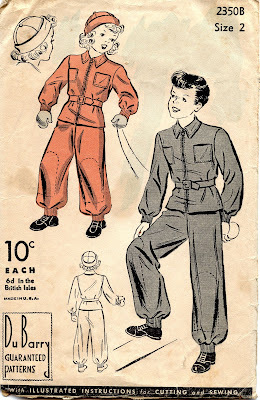 I remember my snow suits being blue quilted nylon and horribly ugly. Du Barry patterns were sold exclusively at Woolworth's and were produced by Simplicity. This is a nice, thoughtful design with the reinforced knees and two patch pockets (for two hankies for runny noses.) As long as the new slide fasteners didn't jam (mine sometime did, thirty years later) they would have been an improvement over trying to cope with buttons with cold or mittened hands. Making up a snow suit in a size two is a labor of love. The center back length of the jacket is only fifteen inches. The outer side length of the trousers will be 24 inches. GORGEOUS blog you have here, THANK YOU so much for sharing these patterns with us!! !